In this article, we have explored some of the best sewing machines for leather. 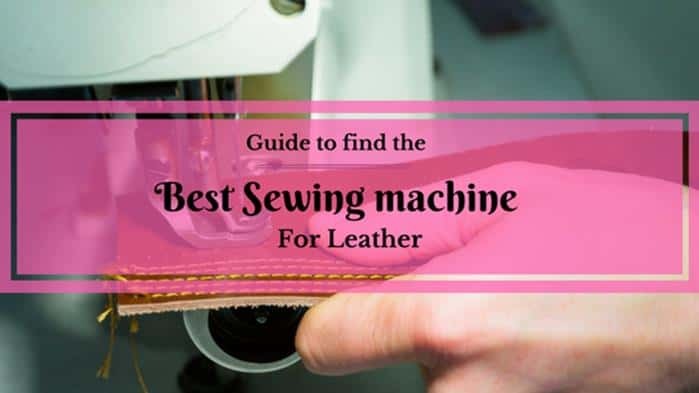 There's a complete guide to selecting the best machine and tips for sewing leather with regular sewing machines. And we focus on different types of industrial leather sewing machines. We'll keep updating this article. So, you'll know which are the best machines available right now to sew leather and the best one for your budget. Leather! Yes. Leather. It's a fine product that is charming, irresistible and durable. It's seldom out of fashion. People are awestruck by its finesse and quality. Crafting goods with leather can be tricky. It requires a machine that handles its firm texture. Regular needles break more frequently on leather and can spoil the quality of your finished product. Standard machines cannot cope with heavy duty fabric like leather, canvas, and vinyl. But it is oh so different with a heavy duty sewing machine. The tougher needles and the grunt of the power motor see you sewing the leather with ease. It becomes a smooth and satisfying experience producing a quality leather product. Why do I need a sewing machine for leather? Can you sew leather with your standard sewing machine? What kind of thread should I use? How important is the working area? How often does a machine need servicing? Does the motor make any difference? Janome is known for its quality. The quality that comes with one of the many computerized machines like the Janome 8077 and mechanical ﻿﻿machines like the Magnolia 7318. It has a reverse stitch lever to secure and lock the stitch. So, threads don’t break and, the product lasts longer. The seven-piece feed dogs system provide great versatility. It means you can sew many different types of fabrics smoothly on the machine like leather as well as knits and silks. The 18 in-built stitches cover all your basic needs, and provide you with some fancy stitches to get your creative side going. The 1 step buttonhole stitch that is essential for a hassle-free perfect button-hole. A stitch selection dial for easy access to the stitch of your choice. It would be handy if there were a speed control button on the machine. Can I sew leather on the Janome HD3000? This machine has many amazing functions. It is excellent for sewing thin leather garments. But don't expect it to sew thick industrial leather well. Read the full review of the HD3000 here. Juki is a well-known brand for producing high-quality, well-crafted sewing machines. And this machine is no exception. This machine is a beast when it comes to speed. You can sew as fast as 5,500 stitches per minute. Great for increasing your rate of production. It sews many different types of fabrics. It has a knee lifter for presser foot. It is a rock solid industrial machine made of metal. Like most industrial machines it's heavy and not portable. It's not a deal breaker. That's because most industrial machines have these problems. Here is a detailed review of the Juki DDL 8700 straight stitch industrial sewing machine. The 4423 is a heavy-duty, high-speed sewing machine with 23 built-in stitches. It's built to last. The body is made of metal and the bedplates of stainless steel. It has a high speed of 1100 stitches per minute. The automatic needle threader threads the needle for you. You have to be careful using the foot pedal. It's somewhat touchy, and it can be a challenge controlling the speed. Can I sew leather on singer 4423? Yes, it can sew through one or two layers of leather and other heavy fabrics. You'd have to experiment with the layers but don't put too much strain on this machine. You can go up to one layer of 8oz to 9oz leather to push it to its limit. If you do it regularly though you will ruin your machine. Should I buy this machine? Although this machine does not have all the bells and whistles, it does an excellent job using the stitch options available. With the incredible speed and ability to handle heavy duty fabric, I'd recommend this machine to anyone starting up. If you have minor leather ﻿﻿project﻿﻿﻿s at irregular intervals, go with this compact machine. Otherwise, opt for an industrial grade machine. It is a futuristic and advanced machine in the Singer brand range made for stylists. With 600 built-in stitches, you have no limits to the magic you can create with all your fabrics. Buttonholes can be challenging to create, but with this machine, it's not a problem because you can sew 13 different styles of automatic buttonholes. The best part is each buttonhole only requires one step, so you get to do more in less time. You'll love the autopilot and speed control options. One press of the button and machine will sew at the speed you choose. It has an automatic thread cutter that trims upper and lower threads with a single touch. There are five different font options to emboss or insert signatures on fabrics. Like most machines in this price range, there is no handy knee lifter. Not all the feet supplied with these machines are labeled. But you can watch videos on YouTube to identify them. Can I sew leather on singer 9960? Yes, it can sew lightweight leather and other light to heavyweight fabrics. But you need to insert the right needle, use the proper foot and the correct tension on the machine to get the right finish. This machine is a superstar all-rounder with all the bells and whistles you can dream of. It can handle your regular sewing, quilting, and monogramming ﻿machine tasks. Using the right settings and accessories, you'll do top-notch sewing with thick fabrics on this computerized machine. But, you can't do upholstery covers. That needs an industrial grade machine, and most of them have fewer bells and whistles. In summary, the Singer 9960 quantum stylist machine is excellent at creating different sorts of clothing at home, using light to heavy fabrics, except upholstery. Another product from the Singer brand - a reliable and high-speed leather sewing machine. It can sew flawlessly at the highest speed of 1100 stitches a minute. You have 32 built-in stitches modes to choose. These include eleven essential stitches, ten decoratives, one buttonhole, and ten stretch stitches. Light on weight despite the metal frame. The LED light is not bright enough to be the only light in the room when you're sewing. Can I sew leather on Singer 5532? Yes, it can. It works efficiently on many types of fabrics such as jeans, pants, coats, leather garments, fleece, sequin, lycra and so on. If you are a beginner with a variety of garments using different fabrics to sew, it will not let you down. Although it can handle many types of light to heavy fabrics, I don't recommend using it on 9oz leather or more. If you have to make leather horse riddles, belts, or boots, you should buy the industrial sewing machine. The Singer is a renowned name in the world of sewing machines. If you want a basic lightweight Singer sewing machine and don't need to sew leather, read this machine review or this one. What are the pros of the Singer CG590? It can sew efficiently at its highest speed of 1100 stitches per minute. This machine has a heavy duty metal frame with the bed plate made of stainless steel. It's built to last. It has 18 built-in stitch patterns with a 4 step buttonhole and three positioning of needles. The presser foot lifter helps you raise the presser foot a little higher to accommodate heavy fabric. You can adjust the stitch size (both length and width) on this machine. Sailrite heavy duty LSZ-1 is a non-fancy, simple, and easy to learn walking foot machine that has lots of power. Can sew up to eight layers of Dacron, ten layers of heavy canvas and many layers of denim and other fabrics. It comes with the basic walking foot, power plus balance wheel and advanced Posi-pin clutching system that transfers incredible power from the balance wheel to the needle to sew the heaviest fabrics with ease. It’s most amazing feature is the built-in piping tunnel that helps users to sew piping on cushions without scratching their heads. No assistance required with this piping feature. The high 3/8” foot lift provides enough room to maneuver heavy fabric. Although it is a compact size, it is heavy and not easy to move around. Can I sew leather on ﻿﻿this ﻿﻿machine? This heavy duty sewing machine a beast with its power plus wheel, walking foot, 5 mm width of zigzag stitch and 6 mm of straight stitch. It can handle heavy fabrics like leather, canvas, denim, dacron and even upholstery materials with ease. But, if you want to make shoes, this is not the machine for you. It can handle the thickness, but it can't reach the difficult inside parts of the shoe material. For that, you'll need a post arm machine or cobbler machine. Yes, if you have heavy materials to tackle and don't have enough budget to buy an expensive industrial machine. This compact heavy duty machine will do the job. It is another good machine to sew leather, easy to use, and can perform at high speed. You'll love the unique top and bottom feed that is engineered to prevent fabric from slipping. The M style large bobbin can gather more thread than the regular bobbin size. You don't have to lubricate it every day because lubrication is automatic. This feature saves time making your sewing a hassle-free experience. You can stitch fast at up to 1600 stitches per minute depending on the fabric. However, it solely depends on the fabric. You can't sew fabrics like leather at such a high speed. It is a straight stitch machine and doesn't come with a zigzag stitch. Yes, it can sew leather with ease and perfection. It supports up to 8mm of straight stitch length, which is more than enough to handle heavy fabric like leather. Yes, if you need a straight stitch powerful machine that can sew leather and other upholstery fabrics. You'll love the power of this simple walking foot machine. Here we have aligned a series of categories that can serve as a map to guide your selection of the best sewing machines for leather. You need to consider a lot of things while shopping for the best leather stitching machine. The features, design, and engineering vary widely across all machines. Our map, tips, and reviews save you time and help you choose the right machine. Leather and heavy-duty fabrics can damage standard sewing machine. Standard machine’s needles are not made to sew leather, and often break while sewing leather. Standard machines cannot carry thread from one hole to another, but the needle keeps on piercing without the thread. These needle piercings can damage the leather, and leave permanent holes. Some leathers have a sticky surface on one side. When you sew this type of leather, it often gets stuck on the throat plate of the machine. Oh boy! this is the worst feeling ever. Mostly you need longer stitches for leather that your regular sewing machine does not support. Standard sewing machines are engineered to sew lighter fabrics, that requires a light stitch grip to hold two pieces of cloth. A light stitch grip doesn't work on a solid material like leather. Some standard machines try to adapt to firmer stitches, but this can cause breakage of both the needle and the thread. Standard machines can also accumulate large lumps of thread on the other side of the fabric which causes issues you don't want when you're working with leather. Going for the best leather sewing machine is a wise investment. It can be costly if you ruin expensive leather sewing with a standard sewing machine. Yes, you can sew leather on some regular sewing machines, but there are limits. Mostly there is a cap on how much thick material machines can accept, and that cap is low on a regular sewing machine. Additionally, you need to prepare your machine for this kind of special project. But if you try to sew more adhesive leather, there are chances you can ruin your machine. If you are a frequent user of leather, then investing in an industrial leather sewing machine can be beneficial for you. Add a scotch tape over the throat plate of standard sewing machine to avoid leather sticking to the presser foot and the throat plate. Don't sew for long stretches of time as it can overburden your machine. Sew in in short bursts to ease the strain on your machine. Try not to create button holes in your leather with the standard machine. There is a high chance of spoiling your project, your needles, and your machine. Be extra cautious and sew only at a slow speed. Make sure you keep an eagle eye on the stitches. As soon as you see that stitches are not coming through correctly, stop and make adjustments. Buy needles that fit your machine and are suitable for leather. Change your needle frequently. Always try a few stitches on a scrap piece of leather first before starting your main project. Remember, not all machines can handle leather. Only a few machines with powerful motors or features such as walking foot can feed leather fabrics correctly. Wanting to learn more about leather stitching machines? Please keep reading. Needles and thread play an essential role in sewing leather. Since the fabric is sturdy, it requires a needle that can pierce the leather with ease and a thread that is strong enough to hold the leather together at the seams. Sometimes, the special threads and accessories are supplied with your high-end purchase. However, in many cases, they're not. With leather, it's best to replace your cotton thread with synthetic yarn. Though synthetic is recommended nylon and rayon are the threads that are typically used and are good options. If you are doing upholstery, make sure you use polyester thread to secure your seams. Before selecting an industrial machine, you need to understand leather is not just used for sewing clothes or crafts. There is a market for a specific machine that helps in sewing bags, shoes, and furniture. You can not pursue all these different kinds of tasks by one machine. There are four categories of industrial machines. It is one of the most common industrial machines used for sewing heavy duty fabric. The flatbed machine has a fantastic feed dog mechanism that helps feed heavy duty materials. They also have a long arm length. They're used to sew sofas, pouches, bags, car seats, tents, and strollers. And you can use it for home products as well. It is the best for industrial use where quick-turnaround on arm work is needed. Used to sew collars, sleeves, and cuffs. These hold vertical bobbins and loopers. The post-bed is an advanced version of the flat base machine. It is mainly used for difficult stitches like sewing gloves and boots etc. Investing a large sum of amount in a sewing machine can be tricky. Before you spend, make sure you know the answers to the questions below. It will guide you in making the right decision on the machine and how much you should be investing. What fabrics are you going to sew? Are you going to use it lightly for home sewing or heavily for business sewing? Be clear in selecting a residential machine or an industrial machine. Do you need a fancy sewing machine with a lot of built-in stitches? Or do you need a leather specific machine? Having a clear mind will help you stay focused and not be distracted by the various sewing machines available in the market. Selecting a machine also depends on the speed required. How quickly do you want to finish your projects? The top speed of machines varies across brands and models. Some Singer brand sewing machines come with a rate of 1100 stitches per minute. Juki has adjustable speeds. Some are fast machines with speeds up to 5000 stitches a minute. If you are a beginner for leather sewing, go for a machine that supports adjustable speed. It will help you decrease the speed while you are learning the craft, and increase the rate as your skill improves. Speed also depends on the fabric thickness, so it's not always about the fastest speed. It also about whether you can match the speed to the type of fabric you are sewing. There are heavy duty brands that offer a less noisy experience. So, it doesn't mean you can't buy a heavy duty industrial machine for your home. ​How much space can you spare for your machine? Sometimes, you need more space (aka long arm machine) for easy maneuverability of larger materials like horse rugs. Of course, not everyone sews horse rugs. But, you need to understand your future projects and usage requirements, to select the leather machine according to your arm needs and available space. This factor is important when selecting a leather sewing machine. You don't want a machine that needs frequent servicing. It could be a vital issue if you live in a remote area. It may not be easy for you to bring the machine in for servicing every few months. Look for machines that either need less servicing or is easily serviced at home. Periodically maintaining the leather machine is imperative. It enhances performance and prolongs the life of the machine. But, the timing of servicing can vary because of how much you use the machine and on usage and fabrics that you are frequently using to sew. When a machine is used only for a specific category of fabrics the machine becomes accustomed to only those fabrics. So, you won’t have to put in a lot of efforts to get it serviced now and then – getting serviced once a year will be fine. If you sew different fabrics and are regularly using your machine, then you might need to service twice a year. If you don't use the machine often, rust can occur. So, keep your machine well oiled even when it's not in use. And before using the machine consider getting the machine serviced to be sure it's good to go. Is it easy to maintain? How often I need to oil the parts? Some machines need more oiling and maintenance than others. Go for one that requires the least oiling of parts and other maintenance so you can save on time and the hassle. Maintenance of sewing machine plays an integral role in keeping machine alive for years to come. Keep oiling the machine frequently. Keep the machine clean and dust free. If you find your thread is stuck or is stiff, then tune the machine before using it. Surely it does. Understanding the motor and its features is one of the crucial things to keep in mind. There are two motor types installed for these sewing machines. Can handle lightweight and medium fabric. Can handle heavy duty fabrics, garments, shoes, and leather. This depends upon your requirements, and what kind of leather projects you are working with right now. What are the prices for entry-level machines? If you are a beginner and looking to occasionally handle some minor, thin and single layer leather projects, you don't need a leather machine. If you follow the guidelines and tips we have mentioned above, you'll be able to sew thin layer leather with most regular sewing machines. Those machines will cost way less than a leather sewing machine. What are the prices for medium level leather stitching machines? If you are trying to work on medium layer leathers, then you can't get away with using a regular sewing machine. Your best bet to go with a machine that has higher pressure feet, bigger stitch length, and more heavy duty features. For medium level sewing machine you can expect to shell out around $350 to $450 from your pocket. What are the prices for the most advanced leather machines? If you are professional and want to work on the thickest layers of leather, you should opt for the top of the line leather sewing machines. A knee control extra high-pressure foot lift. Up to 13 mm stitch length to secure the toughest leather. A big arm length and more heavy duty features. To lay your hands on the best leather sewing machine, you need to pay a premium price. These machines start at $650 and go all the way up to $5000. Sewing machines suitable for leather can sew light, medium and heavy fabrics alike with similar precision. A few of the machines mentioned are for advanced users but not just reserved for advanced users. I believe if you learn how to drive a BMW, equally you can learn how to use a premium advanced heavy-duty leather sewing machine. If budget is not an issue, it is better for beginners to start their learning process with an advanced machine. You will develop advanced skills from the beginning. You can sew an assortment of heavy materials on leather sewing machines like jeans, vinyl, cotton, or linen with the same excellence as you can sew leather. Many of the machines mentioned here are designed to serve the purposes of both industrial and residential users. Although, the price can be a slight issue, selecting a machine according to your need will save you from damaging expensive leather pieces and sewing projects.